Download The Mechanic in Digital HD from the iTunes store. The Mechanic images are © CBS Films. All Rights Reserved. During the 1980's and1990's, there were two names synonymous with action -- Arnold Schwarzenegger and Sylvester Stallone. However, the 21st century arrived, and a new action start needed to fill the shoes left by these two action giants. For a few years, it was a bit of a toss up; but the winner has clearly been names, Jason Statham. Statham begins his 2011 movie run with a remake of the 1970's Charles Bronson film, The Mechanic. The 2011 version of The Mechanic stars Jason Stathom as Arthur Bishop, a lone hit man who is one of the best at his tradecraft. Things start to fall apart in Bishop's perfect life when he must kill his long-time mentor, Harry McKenna (Donald Sutherland). To ease the burden on his sole, Bishop takes in Harry's son, Steve McKenna (Ben Forster), as an apprentice and teaches him his craft. If you are in the mood for action, then The Mechanic is for you. Director Simon West (Con Air, The Cape), provides some of his usual action flair to the piece; however, he also brings his usual dole-drum approach to dramatic scenes. Statham, Foster, and Sutherland try as much as possible to help round out the dialog, but their efforts can just go so far to help this film along. Bringing his strong persona to the screen, Jason Stathom takes the story of the Mechanic and easily makes it his own. From the moment you first meet Bishop during a mission, you feel like you know his character. Statham perfectly hit the mannerisms of what one would expect of an expert hit man. 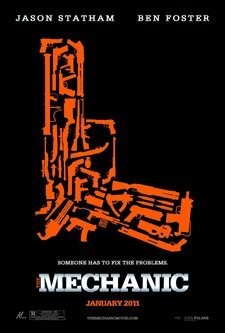 The Mechanic definitely starts out 2011 with a bang that will keep your blood pumping until the next action flick of the year appears. It has great moments that every action junkie will love; however, by 2012 this movie will fade into film fodder. The Mechanic images © CBS Films. All Rights Reserved.